Today, we’re introducing the AdWords app, an easy way to view and manage your ads’ performance when you’re on the go. 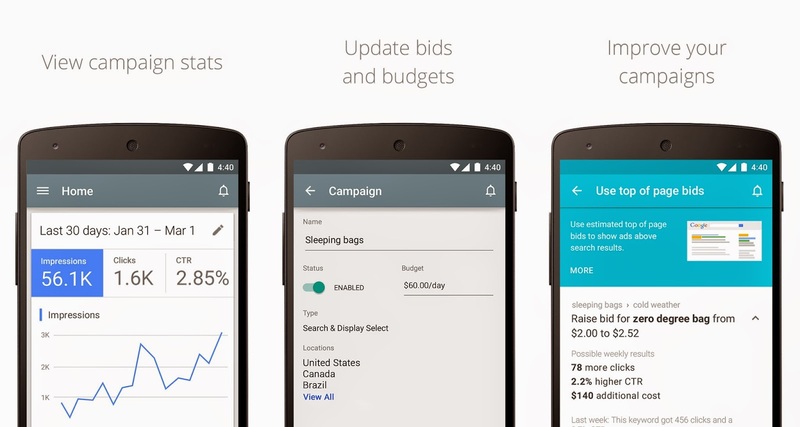 This new Android app is available globally for existing AdWords customers. Businesses, large and small, are increasingly using smartphones to manage everything from customer support to product orders to marketing. Now, you can use your smartphone to keep your AdWords campaigns running smoothly—no matter where your business takes you. Whenever you open the app, you’ll see an overview of your clicks, costs, and conversions. For deeper insights, you can view metrics by ad group, day of week and device. Changes in campaign performance can happen at any time—now you can address them quickly, even when you’re away from your desk. For example, if you see your best performing campaign is maxing out on budget, you can make adjustments so you don’t lose out on potential sales. You can even pause or enable a campaign for a time-sensitive promotion. You’ll also receive customized suggestions that you can act on immediately. For example, if there’s an opportunity to get more impressions by adjusting your bids, we’ll let you know so you can make the change right from the app. The AdWords app is now available for devices that use Android 4.0 or later. To get started, download it today from the Google Play Store. And for more information, visit our Help Center. We look forward to hearing your feedback as you bring AdWords with you on your business adventures. Note: To use the AdWords app, you need to be an existing AdWords advertiser. Not using AdWords? See why you should consider it.